An (e,2e) experiment is the measurement of an electron impact ionization process where both the exiting electrons are detected in coincidence. Such measurements are almost at the limit of what can be known, in quantum mechanical terms, and its description presents a substantial theoretical challenge. There are at least two very good reasons for studying (e,2e) and related processes. In the fi… rst place we are now only beginning to understand the dynamics of the collision process. The range and sophistication of present experiments allow us to identify kinematic regimes where delicate and subtle effects can be observed, stretching current theories to their limit. Secondly, the multiple coincident technique offers us the possibility of an analytical tool that could be used to probe the structure of the target, be it atom, molecule, thin film or surface. Measurements are now being performed at threshold on H, on the inner shell levels of Au and Ag using projectiles at relativistic energies, with spin-polarized electrons on Li, on a myriad of molecules in symmetric, noncoplanar kinematics, and on He in a multitude of different geometries. The technique has recently been extended to excitation ionization (e,3e) and (gamma,2e) experiments. Major theoretical advances have also been made, but much still remains to be done. 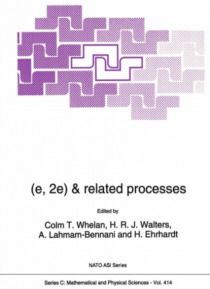 This volume contains the invited papers that were presented at the Workshop on (e,2e) and related processes which took place in September/October 1992 in Cambridge, UK. The three major review papers which it contains together form an excellent introduction to this new and rapidly expanding area of physics and set the scene for the wide range of research contributions, both experimental and theoretical, from the leading scientists in the field.